It is likely that we will see an increase in the use of artificial grass in sports across all of the different types that are played on grass. Football/soccer – one of the most popular sports across the globe, played on natural grass professionally but there is no place that you can’t have a ‘kick-about’ with your mates. That being said, you can’t host a world cup match on a concrete playground, so what really matters to footballers when they compete professionally? And why is natural grass so much more prestigious? Recently, it has been announced that the FIFA Woman’s world cup is set to be held in stadiums that use artificial turf, the first major sport competition to do so. However a group of highly rated female professional footballers have raised their concerns with the fact that they will have to compete on this surface. The negatives for artificial grass in football are fairly obvious, it just isn’t quite natural grass. As goes for a lot of sports, the ball behaves slightly different and the surface will feel different under your feet – for those not at the highest level of the sport it can be difficult to see that the most minor changes can make a big difference when at that level of the sport. On the other hand, it is more economic in the long run for clubs or stadiums that have artificial grass installed, as it requires very little maintenance. As for spectators, the pitch will look the same as natural grass and isn’t going to develop any patchy areas, so it looks like a good alternative however only if necessary. It is clear that the women’s world cup will play a major part in how much we start to see artificial grass in the future. As for golf, it has become a problem for certain countries that have shortages of water and a very hot climate to be able to maintain golf courses, with the sheer amount of water and upkeep they need. 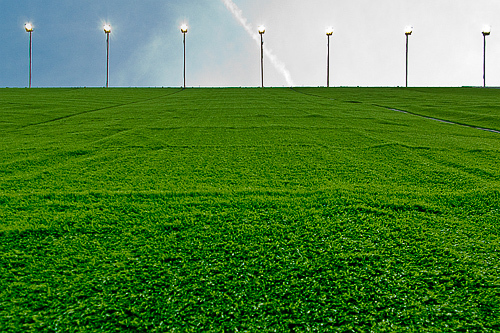 Artificial grass, though it costs fortunes initially, could be the solution for this. 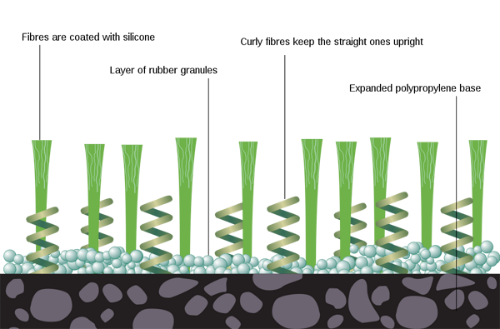 With the ability to create different grades of rough depending on the courses needs, and the ability to also alter the speed the golf ball runs on the artificial turf to that it is acceptable for competition standards it means that artificial golf courses could be a long term for certain countries. However, likewise with football there will be certain professionals who oppose popular competitions being held on this surface. Until they are, we won’t know how artificial turf compares to natural grass with regards to playing golf. It is likely that we will see an increase in the use of artificial grass in sports across all of the different types that are played on grass. Beginning with the woman’s world cup hosted in Canada, it will be interesting to see how fans, and professionals react to the new surface that is sure to become more common. 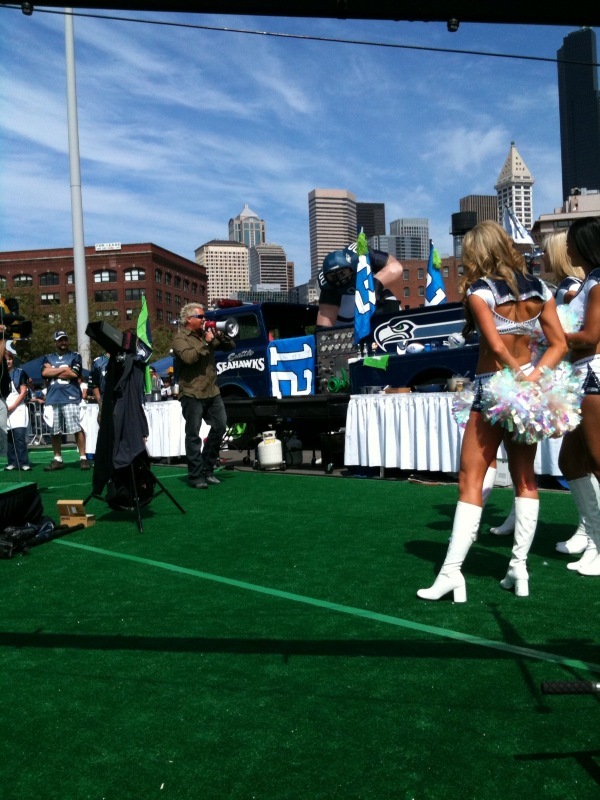 Tailgate Warriors with Guy Fieri and Seattle Seahawks Seagals on the shows field turf set. Sports Techie, I have used artificial grass as a player, coach and official, and I like this tech. I wrote about turf and the newly discovered dangers of rubber crumbs as a cancer causing agent that was part of the lawsuit brought on by the pro soccer women against FIFA that was surprisingly dropped recently. The fact that many manufacturers of turf use old car and truck tires that are torn apart into tiny rubber crumbs as a base layer is alarming because of the carcinogens and toxins they possess that users breath in (especially goalies) during games and practice. Young kids are most at risk. If you have ever slammed your head on turf you know how much it can hurt even to the point of causing a concussion. Knees are also at risk from older turf especially although the medical community is not all together on this possible fact quite yet. Bottom line, do your due diligence if you purchasing turf or are playing on the surface by researching the issue yourself on the web because this news affects football all the way from the NFL, college and high school levels, down to youth leagues, as well as men’s baseball, women’s softball, and lacrosse for boys and girls. The Premier League is a good league to pay attention to because they are investigating turf as a solution for all their organizations to possibly implement, as are the MLS, La Liga, Bundesliga, Serie A, as well as MLB in certain ballparks. The green or sustainability issue is another important part of this question. Turf does not require water so it certainly has that advantage when considering planetary issues. As more and more people and animals move to a big city, less and less natural grass is available, so consider this as well for your pets, and fitness or exercise needs. Expense undoubtedly is a major factor when buying turf so if you go this way over grass, pay the extra money and be sure it is not made from old tire rubber crumbs.